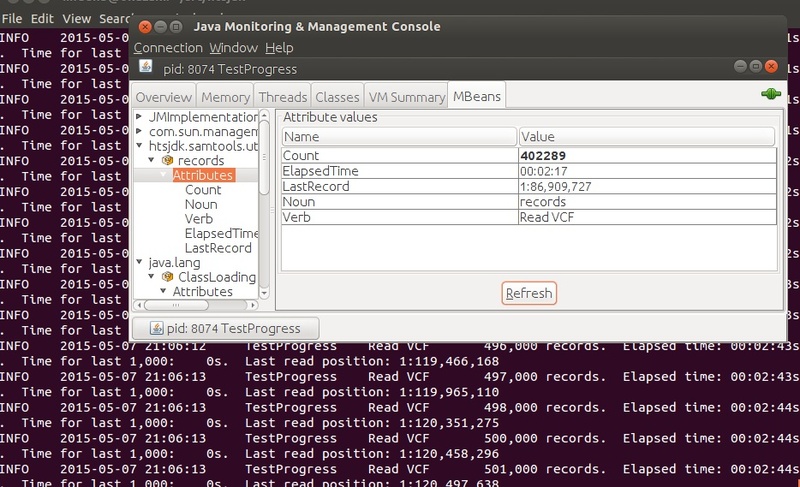 Monitoring a java application with mbeans. An example with samtools/htsjdk. "A MBean is a Java object that follows the JMX specification. A MBean can represent a device, an application, or any resource that needs to be managed. The JConsole graphical user interface is a monitoring tool that complies to the JMX specification." . In this post I'll show how I've modified the sources of the htsjdk library to monitor the java program reading a VCF file from the Exac server. See my commit at https://github.com/lindenb/htsjdk/commit/3c1ac1a18917aaa69f8dc49c70fd893a6a0542c3. Playing with hadoop/mapreduce and htsjdk/VCF : my notebook. The aim of this test is to get a count of each type of variant/genotypes in a VCF file using Apache Hadoop and the java library for NGS htsjdk. My source code is available at: https://github.com/lindenb/hadoop-sandbox/blob/master/src/main/java/com/github/lindenb/hadoop/Test.java. VcfRow must implement WritableComparable to be serialized by the hadoop pipeline. It's awfully sloooooow since we need to parse a htsjdk.variant.vcf.VCFHeader and a htsjdk.variant.vcf.VCFCodec for each new variant. Then a special InputFormat is created for the VCF format. As we need to keep a trace of the Header, this file declares `isSplitable==false`. The class VcfInputFormat creates an instance of RecordReader reading the whole VCF header the first time it is invoked with the method `initialize`. This 'VcfRecordReader' creates a new VcfRow for each line. curl -L -o hadoop-2.7.0.tar.gz "http://apache.spinellicreations.com/hadoop/common/hadoop-2.7.0/hadoop-2.7.0.tar.gz"
curl -L -o 1.130.tar.gz "https://github.com/samtools/htsjdk/archive/1.130.tar.gz"
jar cvf dist/test01.jar -C tmp .